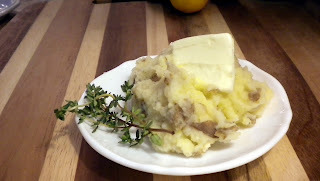 Garlic Cheddar Mashed Potatoes are an easy way to spruce up an age old side dish. Just throw some garlic in the oven, shred some cheese, throw them in with your everyday mash potatoes and man oh man you have a mouth full of heck yea! Enjoy! Slice off the top 1/8 inch of the head of garlic. Drizzle head with olive oil and wrap in foil. Place on a baking sheet and bake until tender and fragrant (about 35 minutes.) Remove from the oven and mash with a wooden spoon once cooled. Place quartered potatoes in a large stockpot and cover with cold water. Heat over medium high heat, bringing to a boil and cook until fork tender. Drain potatoes and mash the potatoes with a potato masher until smooth. Heat butter, buttermilk and sour cream together until butter has melted. Once melted mix together all ingredients and seasonings and serve immediately.